Brock CareerZone Blog: Working for the Weeke... Summer?! 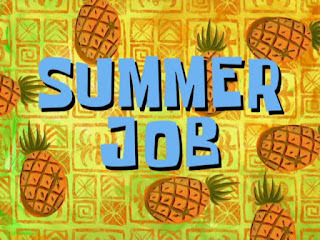 "Wait a minute," you ask, "is this going to be a blog about finding a summer job? ALREADY? I only JUST found myself a part-time job!! I am all job searched out!" "YES!" I answer, "this IS a blog about finding a summer job because guess what: to find the summer job you want and need the very best time to start is now." Now is the time to start searching for that summer job because now is when the employers have begun to post them. The #1 mistake that students make when looking for summer employment is waiting too long and missing out on all of the great opportunities they could have had if they had just started a month or two earlier. And even if it is a little early yet, you don't want to wait until you're absolutely swamped with assignments that you just don't make the time to job search. Therefore, start now! And to help you out even further I am going to give you a few handy steps to follow on how to find yourself a GREAT summer job! 1. Check out job boards today! If you're looking to work on or off-campus, the Career Zone Job Posting Board is a great place to start! Each position is listed by area, and the board lists jobs from the Niagara Region to the GTA, including a wide variety of positions. Then too, if you stop by the Career Resource Centre and we will provide you a handout with a list of various job search sites for federal, provincial or municipal work, including summer camp sites and community directories! Also check out our website for some handy sites. 2. Once you've found a few jobs you'd like to apply for, update or create your resume and cover letter! Ensure to customize each document to the specific jobs at hand using an achievement based writing style! If you don't know what that is, why not check it out by coming on in for some handouts or a resume and cover letter review? 4. Follow up. Once you've applied for your position, do not hesitate to send a follow up email within a week of the application deadline to ensure that an employer has recieved it. This will show the employer your eagerness for the position at hand, and also give them a reason to remember your name when they do finally look over your documents! 5. Don't be discouraged if you're not selected. Summer job search is competitive, with many students searching you are bound to miss out on a few. Don't get stuck in assuming you've got a job in the bag and only apply for a couple of jobs- leave yourself room for flexibility and as many choices as you can give yourself! 6. Finally, set a deadline for all of this. For each step above, set a date of completion, and ensure that you give yourself enough time to complete it all in case something comes up. To help with this planning, make sure you use the SMART Goal System to help you out! Hope these tips prove helpful! Feel free to stop by the Career Resource Centre between 9am and 4:30pm Monday to Friday to discuss job search strategies or for anything else!